Good evening! I hope you all had a wonderful weekend! Mine was busy but fun! I met up with a friend I met through the nail polish world and had lunch today, it was so nice to see her in person! 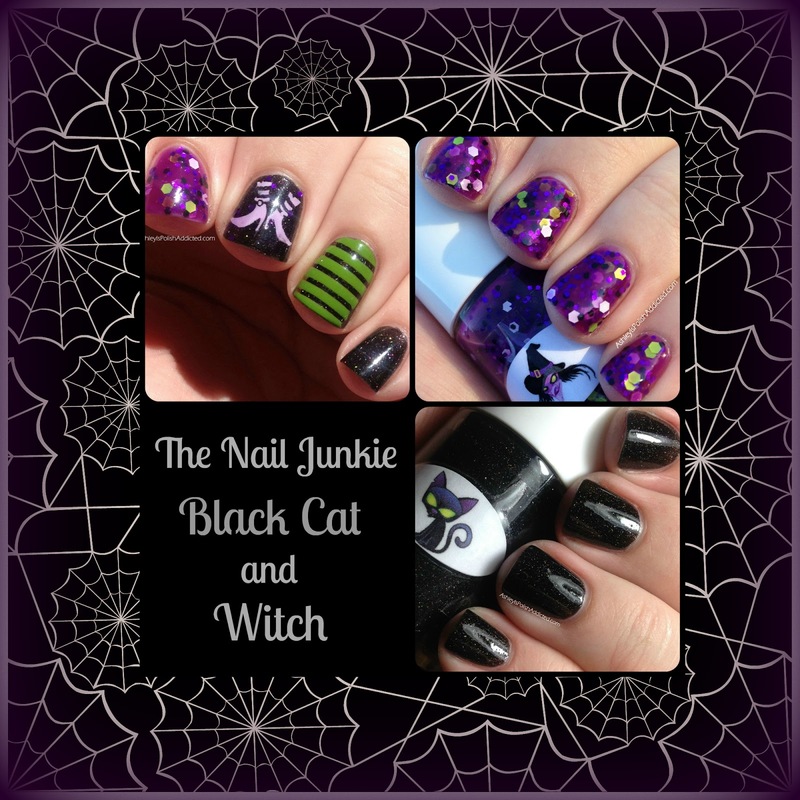 Today I have 2 polishes from The Nail Junkie's Halloween Collection to show you (as well as some fun nail art I did with them) and a giveaway ! Swatches, review and giveaway after the jump! 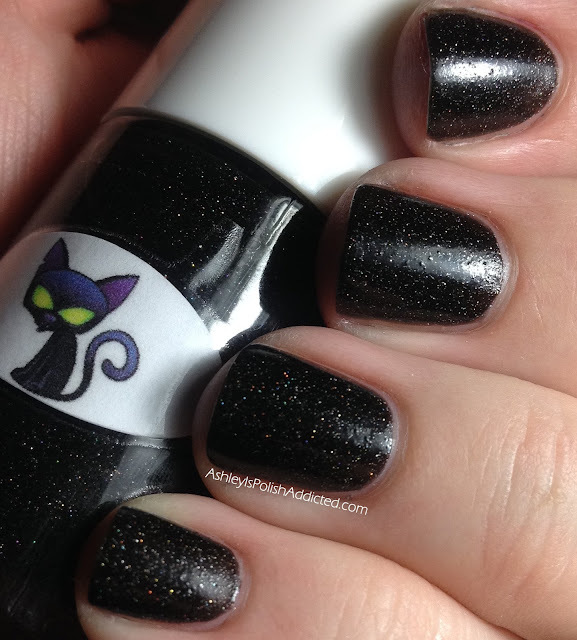 Black Cat is re-formulated from last year (last year's version had large glitter in it) and it is AMAZING! 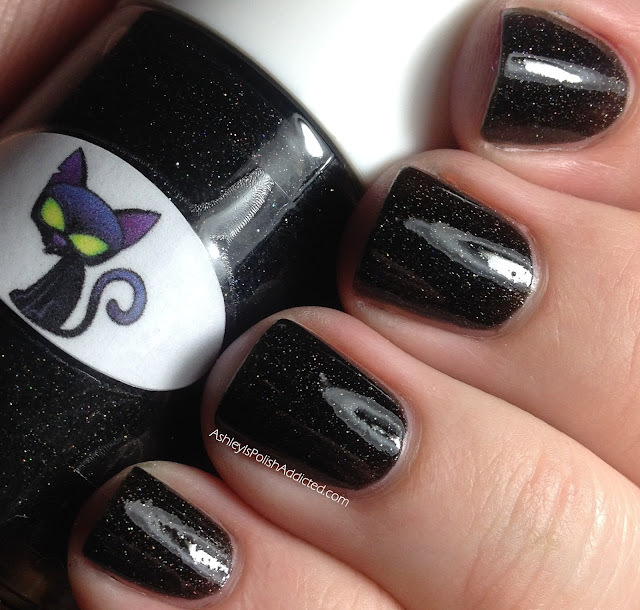 This is now one of my very favorite black polishes and I will be wearing it often. 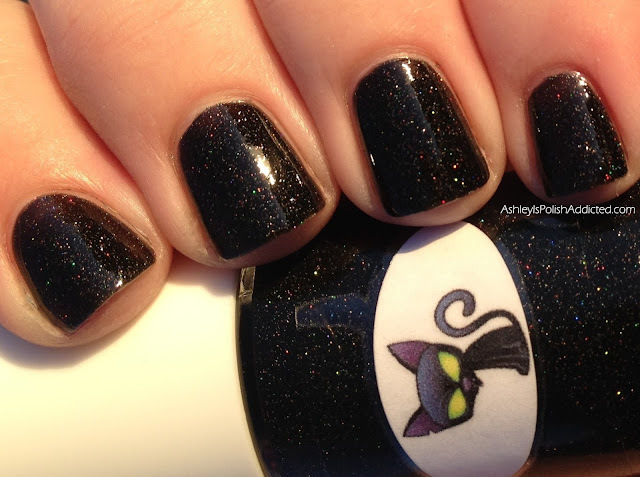 It is a black jelly polish with holographic shimmer. It was completely opaque in two coats. It does dry to a semi-matte finish, which I will show you in the first pic. All other photos feature one coat of topcoat. This is not a topcoat eater! My camera would not capture how beautiful this one is, it is so much better in person. 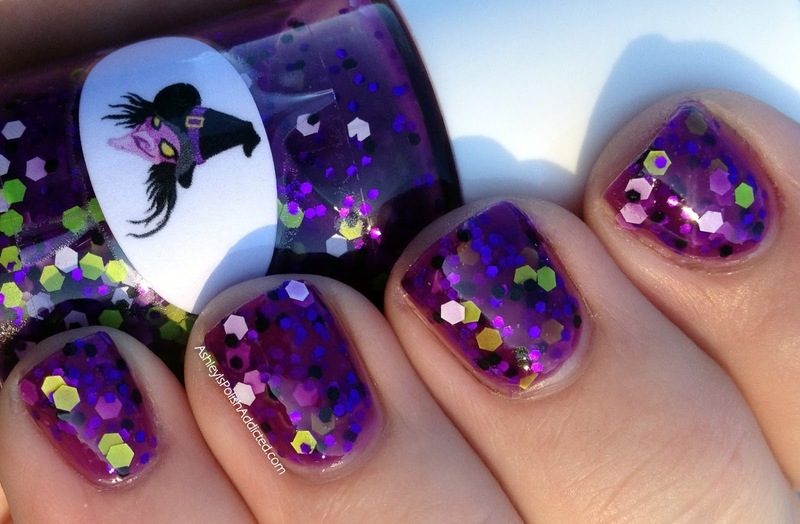 Witch is a gorgeous warm purple jelly with green, black, purple and white glitters. 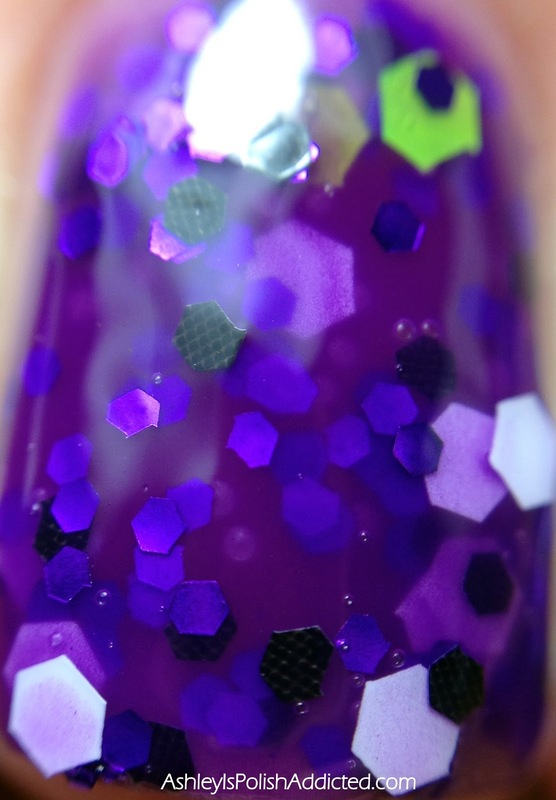 The purple glitters in this absolutely glow and give this polish an extra pop that really makes it special. 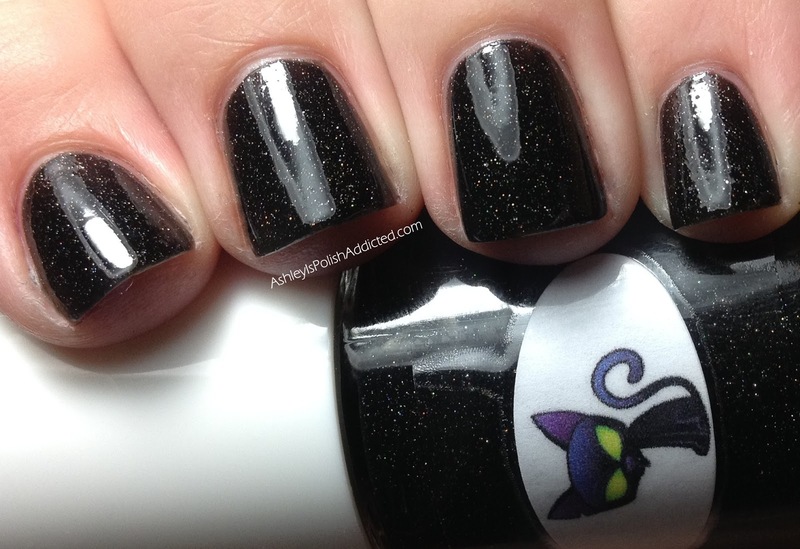 The formula was fantastic and I had no issues getting the glitter out of the bottle or spreading it on my nail. I used 3 coats and one coat of topcoat for all photos. And now for the nail art I did. I had an idea in my head for about a week to do a mani loosely based on The Wicked Witch and when I received these polishes I thought they would be perfect for it. 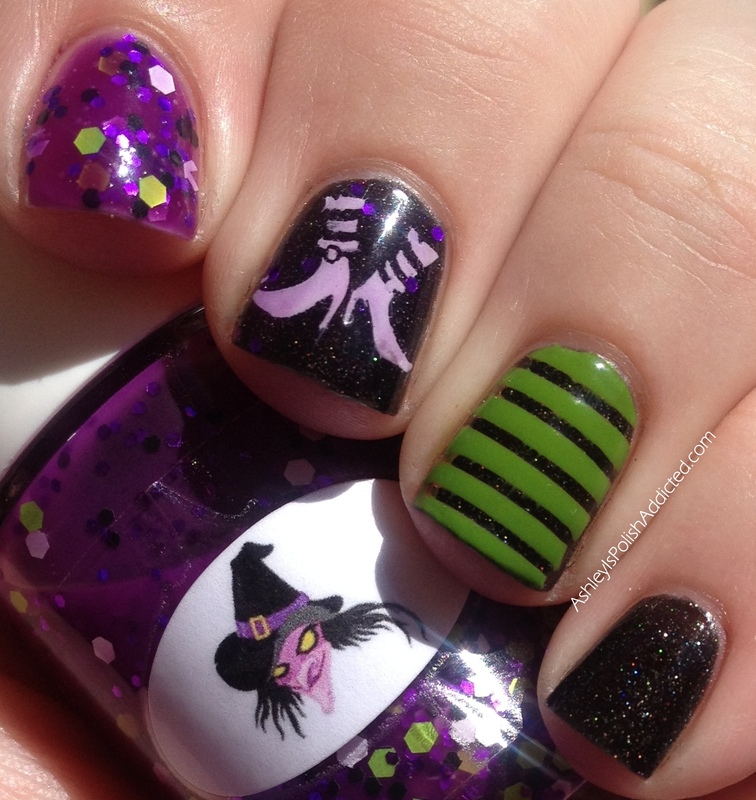 I absolutely loved wearing this mani! I used striping tape and Illamasqua Smash over Black Cat on my ring finger. 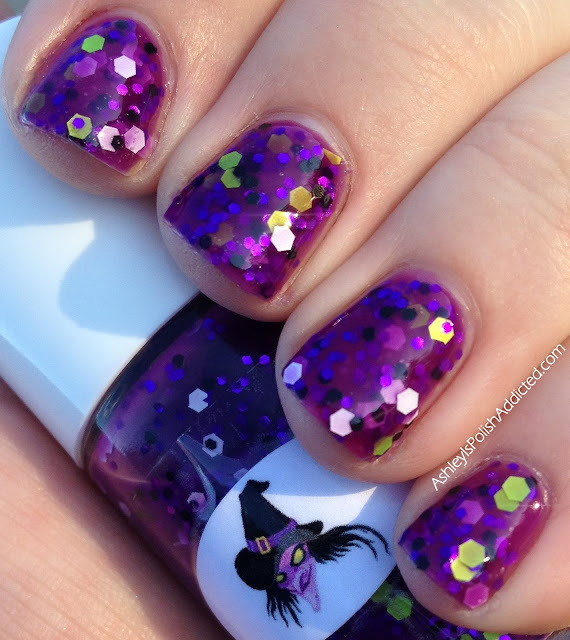 I stamped on the witch feet using a plain white creme and then did a VERY THIN coat of Witch over it to tint them purple just a bit. The Nail Junkie polishes are available at The Nail Junkie Etsy Store here. Make sure you follow her blog and Facebook page for updates and announcements. WHEW! Now for the giveaway! 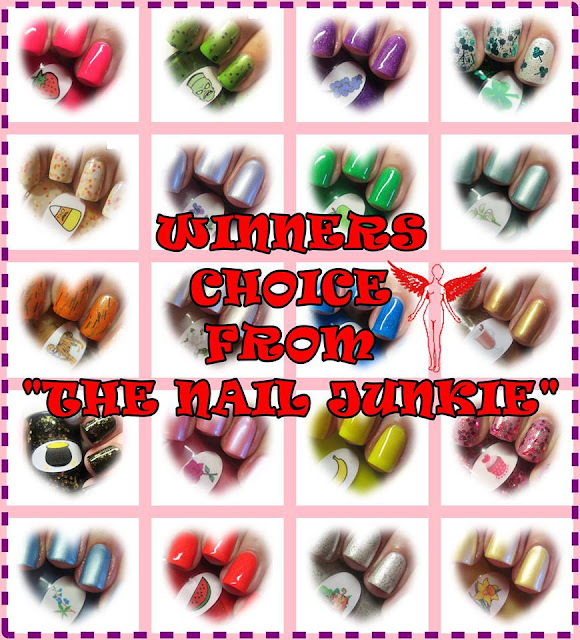 One winner will receive TWO polishes of their choice from The Nail Junkie! International entries are welcome! Enter below and good luck! Giveaway will end on Halloween! The Black Cat is superb! Cats are the most popular pet in the United States. Certainly one of the main reasons for their popularity is the fact that http://catandcats.com/ pose a very low health risk to their owners. However, it is important for cat owners to understand the health risks posed by cats in order to more fully enjoy the benefits of cat ownership.